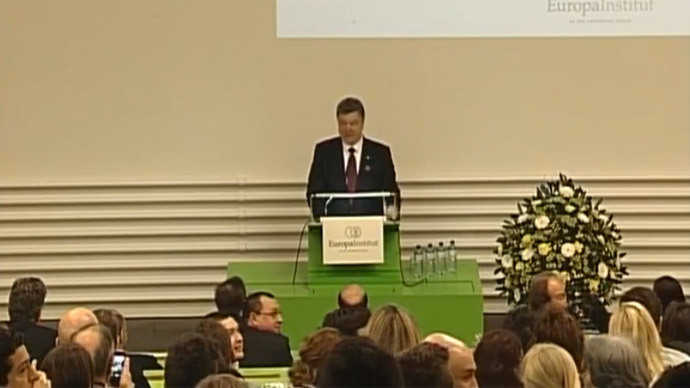 Ukrainian President Petro Poroshenko faced an unpleasant moment during his Swiss visit, when his lecture at the University of Zurich was disrupted by a group of protesters, who booed him leaving him speechless for several seconds. Poroshenko is taking part in the World Economic Forum at Davos, and his program included participation in the Special Churchill Symposium, an event held annually since 1996. The outburst was followed with a concert of booing, which left the Ukrainian leader speechless for several seconds, and he then tried to continue his speech with little success. Poroshenko regained his composure after hearing on obscene phrase in Russian rising over the hum. “If anybody understands what she said, that is exactly the cultural level of this lady,” Poroshenko said with a laugh. “Glory to Ukraine,” he added in Ukrainian. Poroshenko arrived to Switzerland days after ordering a new mobilization in his country, conscripting new soldiers for the ongoing military crackdown of the rebellious eastern regions. The order was followed by a massive offensive on Sunday. Kiev’s armed forces, including bombers, heavy artillery, multiple rocket launchers and missiles have been attacking militia forces since April 2014. The militia took up arms after a ‘coup’ in Kiev led the current government into power. Ukraine and its foreign supporters accuse Russia of supporting the rebels with arms and troops, although no conclusive evidence of such allegations has been presented. Moscow says Kiev is committing war crimes against its own people and that its allies chose to turn a blind eye on those atrocities. International human rights organizations, including Human Rights Watch and the International Committee of the Red Cross, have repeatedly called on both Kiev and the rebels to stop using indiscriminate weapons and protect the civilian population. The UN estimates that at least 4,800 people have died in eastern Ukraine during the conflict.